Octavia Butler was Racialicious before we even existed. The late author is a cult icon, being a boundry breaking black woman in Science Fiction who infused her writing with rich societal commentary on race, gender, dominance, and much much more. Last year, the University Press of Mississippi was kind enough to send me a review copy of Conversations with Octavia Butler, a collection of her interviews, edited by Consuela Francis. The interviews (some of which I will excerpt in later posts) were illuminating, revealing Butler’s damn near prophetic grasp of the underlying challenges facing our society. Quite a few of these interviews are from the 1980s and 1990s – her words still apply in 2011. I savored the book as long as I could, but when I finally finished, I felt a deep and profound sense of loss. As just a casual reader before, I was suddenly confronted with the magnitude of exactly what went with Octavia Butler when she departed from this earth. So I decided the best tribute would be to read, share, and enjoy her work. Readers, welcome to the book club. I’ve had a somewhat haphazard approach to Butler’s work. At first, I had only read Fledgling, on a recommendation for more black supernatural fiction. Then I read Conversations, and finished both Mind of My Mind and Bloodchild last week. Officially, we will start July 1 with the reading of Wild Seed. 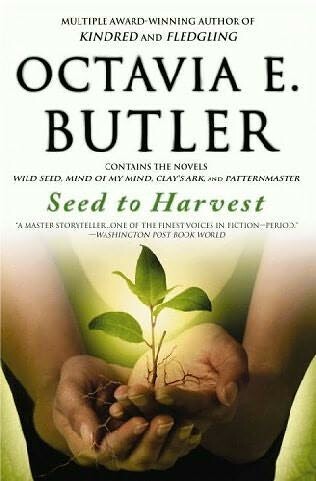 As a new collector of Butler’s work (most of what I’ve read so far were borrowed from the library), I am going to purchase Seed to Harvest, a collection of the Patternmaster series. For those of you working the library, it may take some doing to locate all of Butler’s works – many of the books only have a few copies system, so use this extra week to start tracking things down. We will also attempt to read Survivor, if we can locate it. Butler declined to have the book reprinted, since she felt like it wasn’t up to her own standards. We will read one book a month. Each week, a post will go up around the book, perhaps some interesting dialogue, a question on themes, or an essay on a particularly interesting topic bridged in the books. We will also throw in some scholarly works on Butler, and, if I can, take the next logical step…develop a show pilot around her work. The talent pool on Racialicious is huge, and it would be fun to crowd-workshop a pilot, I think. And at least we know we won’t have the same drama as Earthsea. It’s a whole year of reading. Book club membership requires nothing but you reading the books – you don’t have to follow our order, but this shows the shape of the conversation. Also, a note. My religious education is rather lacking in the finer details, and I’ve noticed that Butler (despite her own ambivalence toward organized religion) plays a lot with biblical style themes. So if someone notices a particularly interesting religious correlation, please speak up and help host a discussion. I will probably miss it. The post Introducing: The Octavia Butler Book Club appeared first on Racialicious - the intersection of race and pop culture.